Although text message marketing is not a new concept, many business still don’t include it in their marketing strategy. At Slicktext, we simplify text marketing so it’s easy for even the least of the marketing savvy. To start, if you fall in one of these five categories, we guarantee that SMS marketing will further your business. Text marketing may not be for everyone, but many businesses will find it useful in building a loyal and engaged customer base. Below are the top five business that we feel are qualified to use text message marketing. If you fall into one of these categories, then contact us today at 1 (800) 688-6290. In the restaurant industry, the more people you can get to come through the door, the more money you make. It’s a very simple equation. If you are a restaurant using text message marketing, you can keep your loyal customers up to date about food and drink specials. Or, if you’re feeling advanced, have us build a custom function in your plan that will allow for guests to be notified when their table is ready. Next to restaurants, retail shops are always running in store and online promotions. Why not keep your list up to date with text message notifications? It is simple, quick, and easy. Most stores use email marketing, but in this day and age, email tends to be a bit archaic. Generation Y usually has their phones attached to their hip, so a text message is sure to reach this audience. Although you might not think churches use text message marketing, they are one of our biggest clientele. Most churches have such a huge congregation, and they find it hard to contact members by email or printed newsletter. Churches have found that the easiest way to notify members of up and coming events is via one simple text message. If you have ever been a part of or run a non profit, you know that board members and supporters like to be kept informed about what’s happening within the organization. What better way to keep them updated than via a text? Similar to churches, a newsletter may go out once a month, but there is no guarantee that this paper ever reaches the target user, or that the user even reads it before tossing it in the trash. This one may be surprising to you, but large companies with 100+ employees love to use our text marketing service. This way, they can keep employees in the loop about internal events. In the past, corporations would have used email to reach their staff, but the problem is, not all staff members have an eye on their email 24/7. By using SMS marketing, corporations can guarantee all employees are receiving and reading their messages. 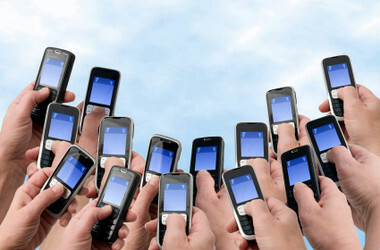 If you’re interested in getting the ball rolling with your own sms marketing campaign, get in touch with us. We would love to help you grow and experience similar results using our platform. We can develop a specific strategy based on your business. Contact the sms marketing professionals from SlickText.com today at 1-800-688-6290.